We’ve been carrying (and really loving) design duo Jayna Anderson and Justin Roy’s custom metalwork pieces for a minute now- from hand fabricated and fringed wall hangings to brightly colored planters, each item is laboriously, and loving created hand in their studio. We thought it was high time we learned, and shared a bit more about the backstory and the ethos behind their design company BOONIES. Tell us about yourselves please! What’s BOONIES all about? How was your design duo born? Hi! I’m Jayna, and 1/2 of the BOONIES. 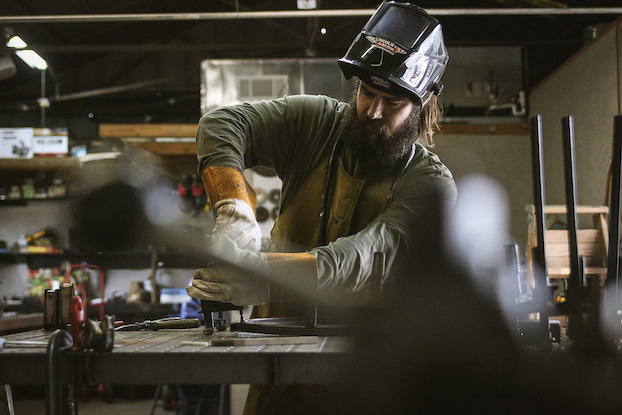 We’re a design and fabrication studio located in Lafayette, Louisiana. Our design duo was born out of a serious desire to get out of Los Angeles. I was working in administration at a modeling agency, and Justin was building sets in Hollywood. I had moved into Justin’s 500 sq ft apartment, and it was basically shelves of tools, a futon, and a bed. So we started working on little projects together making furniture. We used to sip coffee on his balcony together, sitting on this steel bench he made, and daydream about moving to the country, homesteading, living a life less reliant on mass consumerism, ditch the rat race, far from the city. One day, we were like, wait… let’s just do it. If not now, when will we? So we moved out of LA to the closest cheapest place where we more than tripled our living space and cut our expenses in half. That move provided the container for us to have this crash course in running a small business. Take risks, make mistakes, and invest back into ourselves. What is your creative process like when designing a new piece? Are there any signature BOONIES hallmarks that must be incorporated? Our products are handcrafted steel pieces typically finished with a pop of color. We recently really paired down our offerings, but I’d say our designs utilize color for an unexpected brightness to typical metalwork. We just got some of your new candlesticks in (they’re so good)! Can tell us a little bit about the design process and how they came to fruition? Justin had made a coffee table when we first met that had these chain legs. All of these bits of chain meticulously welded together. We ended up selling it, but I couldn’t stop thinking about how rad that piece was. I said to Justin, I want to make a pink chain candlestick. And he’s like, ok sure let’s do it. I came to the shop the next day and he had already made some prototypes. They were made with super thick chain, and didn’t hold a candle properly. We tabled the idea to focus on some custom projects. Then someone gave us this long strand of chain, like hey can you do anything with this? It was the perfect size chain. We played around with the candle holder top and put a few together. I ordered the powder coat colors and a local shop coated them for us. They needed another design tweak after that, but that was it. Cool candlesticks and rad planters: photo by Olivia Perillo. How is the production process different? Since everything is fabricated by hand, do you ever tire of making the same pieces over and over? We really paired down our design offerings when we rebranded in January. We have to work production style on our design pieces to make it financially viable. The candle sticks for example, have so many components to their creation that it makes more sense to spend a day creating a bunch than go through that entire process for one candlestick. We’re designing with production in mind now, and that’s majorly improved our work flow. We don’t really get sick of making pieces on repeat, because so often our week is broken up by someone stopping by our shop with a custom project idea. You also make large scale, custom pieces. Does that make up the bulk of your work? Our bread and butter is custom fabrication pieces. We’ve done work for homes, restaurants, vacation rental spaces, outdoor work, art installations + auto repair work too. We’ve hung rainbow mirrors throughout someone’s home for days straight; we’ve built 12’ steel ladders for someone’s outdoor plants to climb on their balcony; we made this huge darkroom sink; we’ve built floor to ceiling shelving units for a cafe; we’ve created all kinds of fun and challenging pieces that keep things interesting for sure. What are some of your favorite pieces that you've made? We made a bed for my friend Erica, and it’s still one of my favorite pieces. So much so that we might be making something like that for ourselves very soon. How did you get introduced to metalwork? What was your learning process like? My dad is a machinist, my brother is a machinist and a lot of my uncles are as well. But that was always something they did, and I never considered having a part in any of that. When I went to art school, I took a sculpture class where we had to weld a project. Truthfully, I hated it. And I kind of sucked at welding. But when I met Justin years later and he was welding something all the time, I wanted in. So I sort of re-learned how to weld. He was an amazing teacher and it just happened very fluidly. When my family saw that I was starting this business they were really excited for me, and it’s been a real bonding point for my family and I. I call my dad and brother up all of the time with questions or to show what I’m working on, and those relationships feel stronger now. When did you decide to turn your fun-time design projects in a full-time career? Was there a particular moment when you realized you suddenly were running a business? We had full intention of turning it into a business. Justin still was getting calls to go to LA all of the time for custom build outs, so we used that to sustain while we focused on creating more of our own work. It took a while to find our voice, and it feels like we just now stepped into our own, nearly two years later. What some of the challenges of being a small business owner? Does the reality of being a designer and business owner differ from how you envisioned it? How so? The inconsistency of income is the hardest challenge to adjust to. We’re almost two years into business, and recently moved from California to Louisiana, then re-branded. It was hard to do what we needed to do for our personal lives and make the business adapt to that. When we moved, we were so busy with work that we were literally working on multiple projects up until the day we got our moving truck. It was insanity, and really made us doubt the move, even though we knew we did not want to live in the desert anymore. It brought up a lot of doubt, but we were able to overcome that together as a couple and business partners and keep plugging away. I never thought being a business owner would be easy, but there are days where I’m like, ok a paycheck would be nice right about now hah! But I’m living my personal dream, and there’s no way that would happen without some hardship. What are some of the best parts? We have worked with some amazing people. Some really amazing artists and visionaries that trusted us to facilitate their projects. It’s inspiring to hear someone’s story on how they made it, and it’s validating to know that no one was handed what they wanted. Another major perk is setting your own schedule. We work most everyday, but we also take off random days to go hike or take the morning off to cuddle in bed. Tapping into my biological ability to know when it’s healthy, appropriate and needed to take time off, versus listening to what society implies is appropriate, is an integral part of being an unconventional business owner that I love. OMG, you work with your partner everyday? What's it like? Do you two have similar creative processes? Are there some areas that are a real strength for one of you, but not the other? We really don’t disagree on much, except ice cream flavors on occasion, so working together feels natural. But, no we don’t have similar creative processes at all. He designs for how it will be built, I design and then go- ok how are we going to make this? ! And I’m the one who can e-mail people all day with a smile on, while he has to get his hands dirty or he gets stir crazy. We respect and appreciate each other’s roles both at home and at work. He also does a lot of house work and takes care of our dog, cats + chickens while I’m working on 5th Dimension, so, how could I not love him for that? Justin at work: photo by Julian King. What does the work-life balance look like when your business partner is also your husband? How do you manage it? Is work life separate from your home life, or does it all spill over and blend together in a wonderful way? We work a lot, and it inevitably will spill over into our personal time. The key has been shifting our attitude around work to not feel stressed or pressured in an unhealthy way. Our work-personal time is starting to blend in a really beautiful way, and that was always our hope. We want to promote this way of life that feels real and tangible to us. We want to learn and grow to sustain with this land, to inspire a shift in the way people consume, and to redefine what abundance means in a society that promotes over consumption and excess. Sharing that goal comes down to making meals together, caring for our home together, and working together in support of this vision. We’ve become a very close family unit with a strong love for each other in all capacities, both at work and at home. In addition to the BOONIES, Jayna, you also have your own skin care line. Tell us about it please! How do you juggle having two small businesses? It’s been wild! I am the person behind 5th Dimension, an herbal skin care line. It started out as a hey I made extra of these products if anyone wants one, then turned into a business. That sounds cliche, but it’s true. It’s been just over one year since I decided to put a name to it and turn a hustle into a business. I have no formal business training, so this past year was wild managing two businesses and a big move. I take days for 5th Dimension and days for BOONIES. Justin is a huge support, and works every day at BOONIES to facilitate what we do. I believe in myself and I believe in what I’m doing. I manifest my dreams, putting notes on my altar space, and meditating through the rough patches. I put in the work and I step away. I sleep 8-10 hours every night and cook most of my food. I take a ton of baths and try to read everyday. Essentially, I make sure I am taken care of before I step up to bat for either business, and I think that’s the only sustainable way I can manage all of this with minimal stress! BOONIES recently underwent a brand redesign (and got its cool new name)- in what ways did your feel the brand had evolved that led to this point? Well, we started out rehabbing furniture, turning Junk into something beautiful. So our old name, the Junkyard Co., kind of had this rogue feeling about it, not some refined curated brand, but something gritty. But as we grew, we focused on making our own work, and the name didn’t feel right for us. We’re very much into homesteading… so BOONIES felt like this fun and light way to stay true to who we are. Having left LA to become countryfolk, it was almost like poking fun at ourselves, and we loved that. Major thanks to PJ Crisanti + Matt Gribben for designing our rebrand in a way that felt progressively backwoods- just how we like it. You recently moved from California to Louisiana! What inspired the move? How is life down South? We really wanted to live somewhere that has a nice growing season for food, and where we could live a bit more away from other people. Now that we aren’t city people anymore, we realized how much we love our space. California just wasn’t that place for us. Justin is from Louisiana, and we felt called to be closer to family. So far, we love it here. It’s beautiful land, and I’m currently attending Herbalism School in New Orleans which is opening my eyes to deep and complex beauty of this bioregion. What's on the horizon for BOONIES? We recently expanded our shop’s capabilities to more technical metalwork processes, and so I’m sure you’ll see some new designs utilizing those capabilities in the near future. We’re also hoping to launch a brick and mortar shop in the future. Maybe 2020? !